(above) Shelter Seat in Coronation Park, built in conjunction with Tino Rawnsley, 2007. Oak frame, copper sheet roof. (above) Barn renovations near St Issey, working with Jamie Lovekin, 2006. 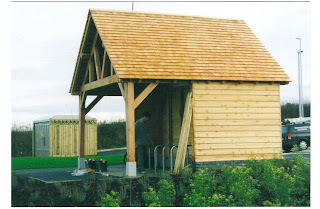 (above) Douglas Fir Bus shelter and bike shed outside the hospital in Launceston. Colin Milburn's project, 2003. Western Red Cedar shingles and cladding from Tino Rawnsley. (above and below) Joel Hendry designed and lead this project, the biggest one I've worked on. Adding to the remains of a Dartmoor longhouse, we built this 8 bay frame in the summer of 2006, using barn space in the farm next door, with Devon oak from Anton Coaker. A great job to work on.